iPhone revenue was 62% of total Apple revenue with -15% growth year-over-year. Services accounted for 13% of total sales. Year-over-year growth was 19%. Macs accounted for 9% of sales, with 9% growth. Wearables, Home and Accessories was 9% of sales (up from 7% of sales a qtr earlier) with 33% growth. Wearables include Apple Watch, AirPods and Beats products. iPads were 8% of total Apple sales, with 17% growth. Profit estimates just got gashed. Why isn’t that headline news? Hmmm. 2019 estimates fell from $13.48 to $11.41 this qtr, which takes 2019 profit growth estimates from 13% to -4%. Apple does big stock buybacks, which helps EPS (profits). And at this point it needs to. Apple has an Est. LTG of 13% per year, a yield that’s gone from 1.5% to 1.7% since last qtr. But profits are expected to decline this year. 2020 estimates dropped from $14.82 to $12.75 this qtr, and now its questionable as to whether the company will be able to beat 2018’s high-water mark of $11.91. AAPL could be “no growth” for two years! The company needs a new catalyst. Last qtr I reduced my position in this stock, and this qtr I’m out. AAPL will be sold from the Growth Stock Portfolio and Conservative Growth Portfolio but I’ll keep the stock on the radar. AAPL is up off its lows, but something tells me that has to do with stock buybacks, and a recovery in the S&P 500 funds that buy this stock without analysis. The Est. LTG of 13% per year is ok, and investors get a yield that’s close to 2%. This stock usually sells for a mid-teens multiple (P/E) and the P/E of 15 is around where it should be. That’s not a good thing because growth is expected to go negative and estimates have declined two straight qtrs. 7% profit growth on -5% sales growth. Wow stock buybacks really helped. 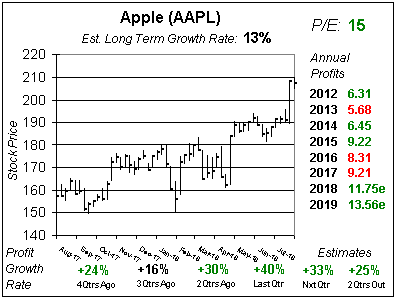 Estimates were for 25% profit growth, AAPL missed the mark badly. Why is this stock up this year? These numbers are crappy. Annual Profit Estimates got gashed this qtr. Oh my! Qtrly profit Estimates are for -13%, -10%, -7% and 9% profit growth the next 4 qtrs. And that 4QtrsOut estimate looks good just because the company just missed badly, and the comparison is easy. This chart uses analyst profit estimates to calculate a Fair Value. I choose the valuation, or the P/E the stock should sell for. From 2010 to 2016 the P/E was around 11 as the stock was punished for being a hardware manufacturer. My Fair Value is a P/E of 13, and $11.41 x 13 = $148. But with profit estimates on the decline, that could come down next qtr. Notice the stock is currently below my 2020 Fair Value. And since 2020’s profit estimate just got slashed 14%, this Fair Value might get reduced in the coming qtrs as well. Apple has had its ups-and-downs the past decade, but overall buy-and-hold investors have made 30% a year with the stock during the last decade. Still, this is a hardware stock and previous hardware stocks that fizzled out include Nokia and Dell Computer. Apple is now trying to transition into a more well-rounded company, but with iPhone sales still above 60% of revenue the company has a long way to go. AAPL got a boost in profits in 2018 from a new iPhone. But when we look at this chart, that move higher looks like a flash-in-the-pan. Now that iPhone revenue is negative, the company needs to shift its focus on making watches to track your health and hope the Apple Watch becomes the next catalyst. 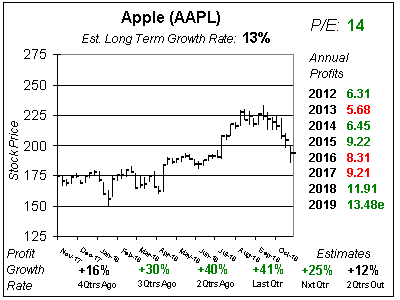 AAPL will be sold from the Conservative Growth Portfolio and Growth Portfolio today. Apple is Selling Off — Is This Time to Bail?